ASAP® (Patent 7,977,629 ) is a modification for existing atmospheric pressure ion (API) sources that enhances the use of LCMS instrumentation. ASAP can be used as a substitute for vacuum solids probe analysis. Fragmentation can be induced by cone-voltage or in conjunction with an MS/MS instrument by collision induced fragmentation. It is compatible with ESI, APCI and LC/MS and does not interfere with their functions when not in use. Thus, LC/API-MS, ASAP, and infusion ESI can be run with only minimal change over time. With some instruments (e.g. Thermo Fisher Scientific) the APCI or HESI probe supplies the hot gas for ASAP and others (e.g. Waters) either the ESI desolvation gas or APCI probe can be used as a hot gas supply. 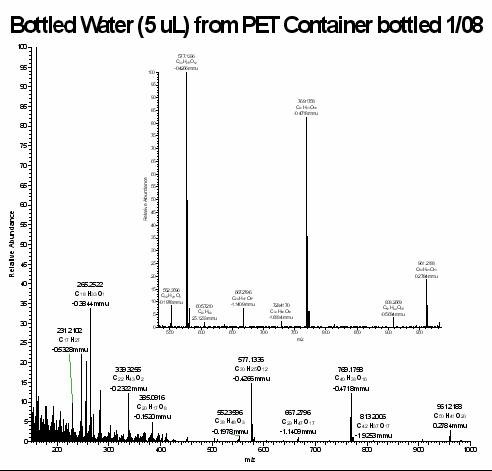 Approximately 5uL of bottled water was dried on a melting point tube and inserted into a Thermo Orbitrap™ mass spectrometer using the ASAP probe. The PET cyclic oligomers leaching from the bottle are detected. A small piece of carpet fiber was inserted into the quartz tube used in a CDS Analytical Pyroprobe 2000™ pyrolyzer. Using the ASAP Pyrolysis Adapter, the probe was ballisticly heated to 425 degrees celsius inside the mass spectrometer source. The nylon monomer, dimer, trimer, and tetramer are detected. The open end of a melting point tube was scrapped along a small section of carrot skin prior to insertion into the API source using the ASAP probe. Beta-carotene was readily observed along with other volatilizable components. A 1uL sample of biodiesel processed from corn oil was placed in the hot nitrogen stream of the API source using the ASAP probe. The mono, di and tri glyceride methyl esters are observed.